If you come to do shopping in Bali, you will find that yourself spoiled with choices with everything from international brands to most importantly locally produced goods. The best place to shop in Bali is in all the local markets but bear in mind that you would have to do some serious exercise on your bargaining skills. 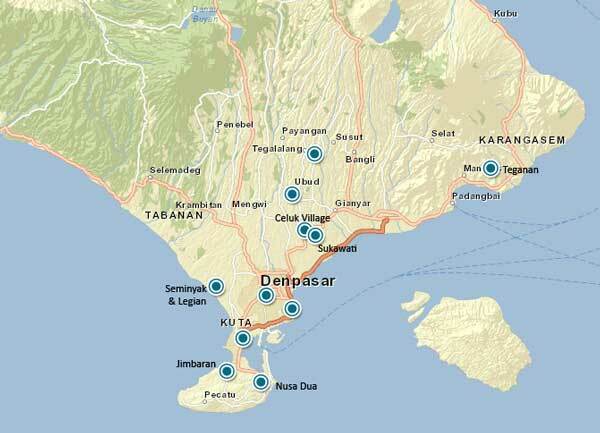 Shopping areas around Bali are such as Denpasar, Kuta, Ubud, and various villages located nearby. So come to Bali with enough luggage space to lug your goods back if you are keen to shop as you will be sure to find many things to buy. You can look out for local handicrafts, silversmiths, gold, surf and beach wear, traditional fabrics and lots of art products. All of the things here are of good quality if you know where to find them. 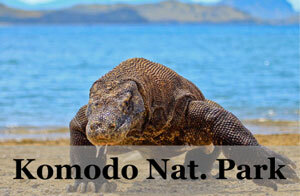 Go to Bali with empty luggage and go home with a full one – and more! Denpasar, as a capital of Bali and also where the airport is located, you may be sure to find a lot of places here to shop in. 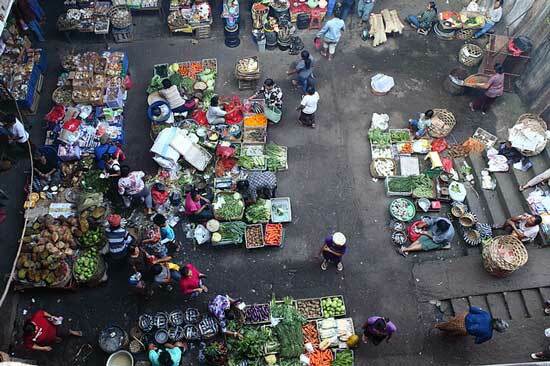 The biggest traditional market is called Kumbasari market, near the Badung’s river. Here you will get to experience a traditional Indonesian market where you will find local people doing their day to day shopping. You will find food, spices and everyday stuff at the basement and second level. You would probably want to shop on the third floor as you can find things like household wares, clothes, arts and crafts. But remember to hone your bargaining skills here to get a good price. 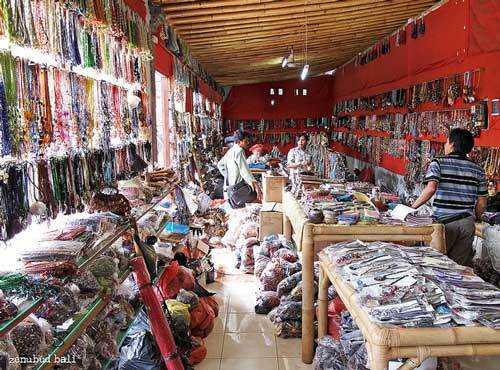 You can also shop at Gajahmada Street for handicrafts, Sulawesi Street for fabrics and household wares and Hasanudin Street for gold shops and jewelry. 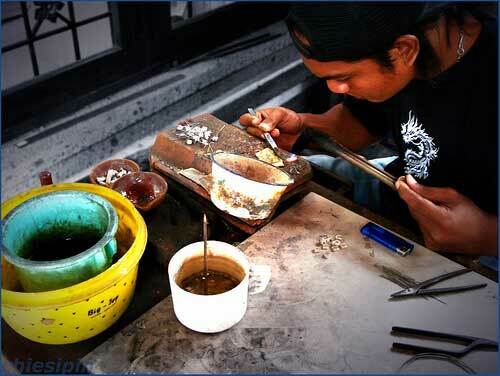 This village is famous for gold and silversmiths. There are choices of different gold and silver jewellery like rings, bangles, chokers, earrings, pins, brooches and other accessories. 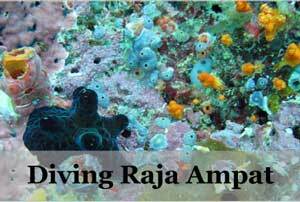 You may even find some with the mother of pearls here. All these shops are run by the individual local owners, which is good for responsible and eco-tourism. 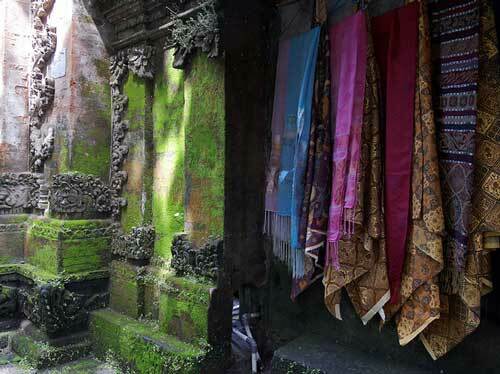 Ubud is no stranger to travelers and you can expect it to be pack with galleries and shopping places. The best place to shop here is the Monkey Forest Road (Jalan Monkey Forest), where not only is it catered to visitors with good quality restaurants, cafes, backpackers resorts and hotels but it also cater in terms of shopping. There are shops that sell local designs, painting, handicraft, antiques and more along this street. Sukawati is popular for its Art Market where it is rich with Balinese art and craft with the cheapest bargain you can find. 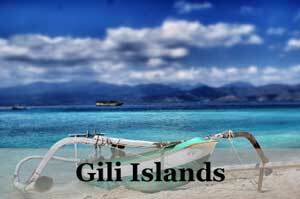 You will find cloths, paintings, statue, jewellery and other items featuring Balinese best in arts. It is a two-floor building packed with tourists and locals coming here to fill up on handicrafts and traditional handmade products. This is probably the widest road in Bali, connecting Nusa Dua to Sanur. here you will see the road line with antique, pottery, natural stone and furniture stores. You will need to haggle well here too as usual. Kuta Square is a shopping centre about 50 metres from the Kuta beach. Beautifully designed with boulevard style, it is filled with shops from international and local brands featuring beach wears, surf wears like Billabong and Quiksilver, sports brands like Reebok or Nike, and local brands like Milo’s and Animale. Just nearby the Kuta Square, this traditional market, on the other hand, is packed with locally crafted souvenirs and goods, where as usual haggling is needed here. Just be polite and smile and you might just get a price that is win-win for everyone. There is a shopping center in Jalan Danau Tamblingan in Sanur. This shopping center is similar to the one in Kuta but will lesser hawkers. You will also find nice restaurants along this place. Also check out Pasar Sindhu for good local eats while shopping for local products here too. 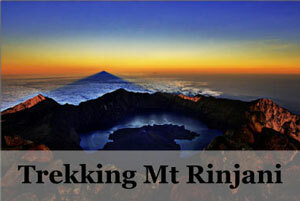 Jenggala Keramik is the best pottery maker in Bali where it is the epitome of quality Bali products. 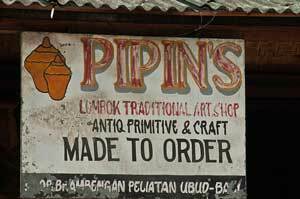 This shop used to be in Sanur and has now relocated to Jimbaran and the business had been running since 1979 from a small industry in Sanur to now as a company that produce high-quality pottery and glassware internationally. There are many villages around Tegallalang that specialize in wood carvings, You can find softwood figures and carvings like flowers, animals, fruits and other unique features, all handcrafted and brightly painted. 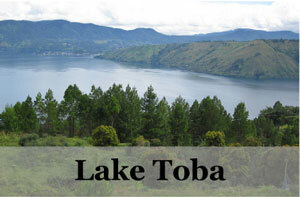 All along the 12km road, you can get your hands on furniture and handicrafts of glass, wood, bamboo, ceramics and shells. Some even say these here are better quality than the one in Sukawati Art Market or Ubud Market. Tenganan or known as the Bali Aga village by the Balinese people is located in Karangasem and is the only place that produces Geringsing fabric. 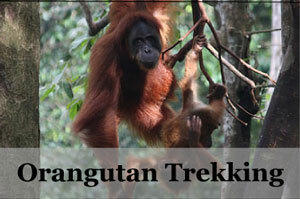 Geringsing fabric is taken from nature and the process to make it is very traditional. No chemicals are used in the process. Legend has it that they use to use blood to dye the cloth red but fret not as now only vegetable dye is used. Note that the prices for the fabrics are high though. Nusa Dua is not the best place specially just for shopping but you may find the usual mega department store carrying brand names and international retailers called The Bali Collection. You can find anything here from shopping to food and spa. The upside is that this place is clean and well maintained with nice places to hang out. 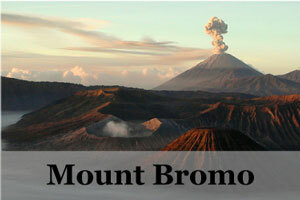 Besides the many things to do in Seminyak, shopping is one of them. The shopping area is down the main street, Jalan Kunti and Jalan Laksmana. Here you will find clothes, shoes, household wares and leather. For Legian head to Padma Street and Jalan Melasti for local market stalls. 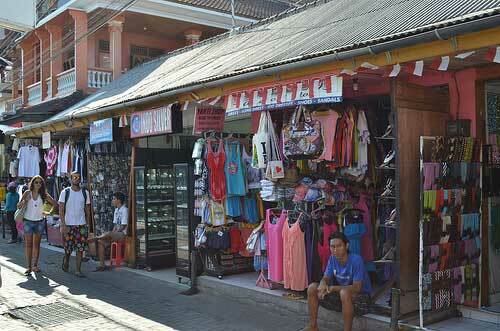 Legian area offers things from all that’s mentioned above easily and is one of traveler’s favourite shopping area.